Essential programming tips at your fingertips! This handy programmer’s reference provides quick access to syntax, functions, classes, methods, as well as the Standard Template Library (STL). The book covers ANSI/ISO Standard C and C++, including the new C99 standard. 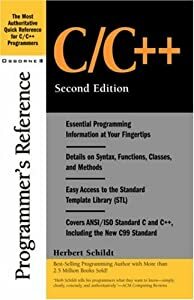 C/C++ Essentials and Syntax on One Handy Reference! Get a wealth of core C/C++ information in this well-organized fingertip reference. Herbert Schildt, the world’s leading programming author, has revised his perennial best-seller to reflect the latest information on ANSI/ISO Standard C and C++, including C99, the new standard for C. Inside, you’ll find clear explanations of all C and C++ programming syntax, keywords, commands, functions, and class libraries. No programmer can remember the precise syntax of every C/C++ element–now you don’t have to because it’s all here. With this quick-access guide on hand, you’ll be able to implement efficient solutions to all of your programming challenges rapidly. As an experienced programmer, this book is simply ideal for me. Whether to remind me of the ordering of parameters to functions or to recall the subtleties of using the STL, it’s all there. “static is a data type modifier that creates permanent storage for the local variable that it precedes. This enables the specified variable to maintain its value between function calls, for example. “static can also be used to declare global variables. In this case, it limits the scope of the variable that it modifies to the file in which it is declared. That is without compare the cleanest description of the keyword I’ve ever seen. This is a typical entry; it’s all there, with enough detail that I recall exactly what is going on. I am amused by the various bad reviews which complain that this is not a “complete” reference. It is exactly the judicious editing and concision which makes this so useful to me. My only complaint is in fact the opposite; that in some cases it goes into too much detail. There are sporadic “Programming Tips” scattered throughout, and I find each of these to be a waste of time in a reference text. These would seem more appropriate in an introductory text. In short, this is an extremely useful reference for the experienced developer.